Diabetic complication is very high even among the young. In a study of 2630 patients who developed diabetes before age 25 type 2 diabetes was more common than type 1 diabetes (48% vs 43%) . The prevalence of all major complication was very high among those who had diabetes for at least 15 years. Retinopathy was seen in 72% and 77%, nephropathy in 22% and 12% and neuropathy in 35% and 21% of T2DM and T1DM respectively.11 Thus early onset diabetes carries a grim prognosis in India.1 This is probably due to poor management of blood sugar and other contributors as well as the failure to use appropriate medications. 2. Swerdlow AJ, Laing SP, Dos Santos Silva I, et al. Mortality of South Asian patients with insulin-treated diabetes mellitus in the United Kingdom: a cohort study. Diabet Med. Aug 2004;21(8):845-851. 3. Bellary S, O’Hare JP, Raymond NT, et al. Premature cardiovascular events and mortality in south Asians with type 2 diabetes in the United Kingdom Asian Diabetes Study – effect of ethnicity on risk. Current medical research and opinion. Aug 2010;26(8):1873-1879. 4. Fischbacher CM, Bhopal R, Rutter MK, et al. Microalbuminuria is more frequent in South Asian than in European origin populations: a comparative study in Newcastle, UK. Diabet Med. 2003;20(1):31-36. 5. UKPDS 12. UK Prospective Diabetes Study. XII: Differences between Asian, Afro- Caribbean and white Caucasian type 2 diabetic patients at diagnosis of diabetes. UK Prospective Diabetes Study Group. Diabet Med. 1994;11(7):670-677. 6. Mather HM, Keen H. The Southall Diabetes Survey: prevalence of known diabetes in Asians and Europeans. Br Med J (Clin Res Ed). 1985;291(6502):1081-1084. 7. Raymond NT, Varadhan L, Reynold DR, et al. Higher prevalence of retinopathy in diabetic patients of South Asian ethnicity compared with white Europeans in the community: a cross-sectional study. Diabetes Care. Mar 2009;32(3):410-415. 8. Mather HM, Chaturvedi N, Fuller JH. 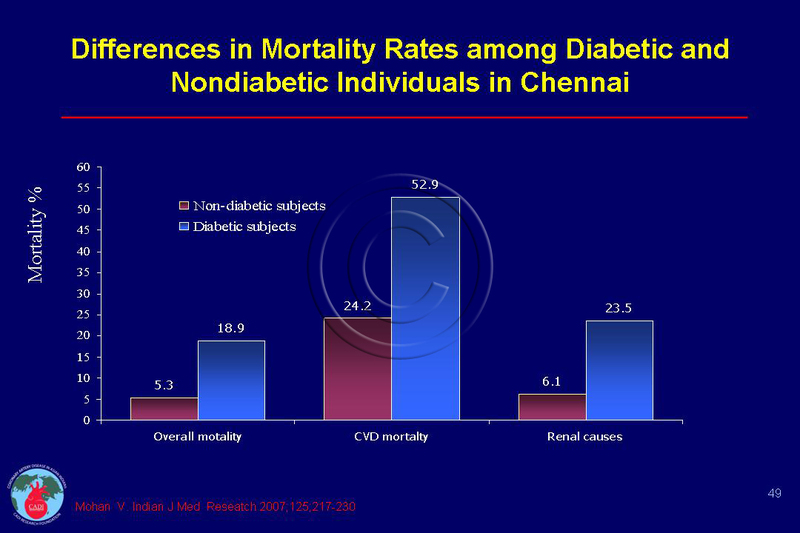 Mortality and morbidity from diabetes in South Asians and Europeans: 11- year follow-up of the Southall Diabetes Survey, London, UK. Diabet Med. 1998;15(1):53-59. 9. Forouhi NG, Sattar N, Tillin T, McKeigue PM, Chaturvedi N. Do known risk factors explain the higher coronary heart disease mortality in South Asian compared with European men? Prospective follow-up of the Southall and Brent studies, UK. Diabetologia. Nov 2006;49(11):2580-2588. 10. Karter AJ, Ferrara A, Liu JY, Moffet HH, Ackerson LM, Selby JV. Ethnic disparities in diabetic complications in an insured population. Jama. 2002;287(19):2519-2527. 11. Amutha A, Datta M, Unnikrishnan IR, et al. Clinical profile of diabetes in the young seen between 1992 and 2009 at a specialist diabetes centre in south India. Prim Care Diabetes. Dec 2011;5(4):223-229.